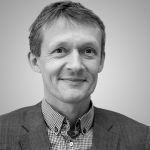 Stephan Hülsmann is an Academic Officer at UNU-FLORES where he leads the Systems and Flux Analysis considering Global Change Assessment unit. He studied Biology in Göttingen, Kiel and Lund (Sweden) and graduated (Diplom) in Göttingen, Germany. He obtained his PhD at Technische Universität Dresden (integrated water quality management in reservoirs), followed by a research project at the Netherlands Institute of Ecology of the Royal Netherlands Academy of Arts and Sciences. After returning to TU Dresden he worked as a senior research scientist with the interdisciplinary Hydro Sciences Department, Institute of Hydrobiology, prior to assuming his function as Project Officer at the UNU Vice Rectorate in Europe and UNU-FLORES, mainly managing and establishing partnerships and projects in Africa. His research focuses on integrated water and watershed management, nutrient fluxes, and on responses of aquatic systems to stressors such as eutrophication and climate change, using systems analysis approaches, modelling, as well as experimental approaches. Stephan Hülsmann is currently also serving as the PhD Programme Coordinator for the joint Doctoral Programme in Integrated Management of Water, Soil and Waste with Technische Universität Dresden. Hülsmann, Stephan and Ardakanian, Reza, “The Nexus Approach as Tool for Achieving SDGs: Trends and Needs” in Managing Water, Soil and Waste Resources to Achieve Sustainable Development Goals, ed. Hülsmann, Stephan and Ardakanian, Reza ( Cham: Springer Nature,2018), 1-9. Ardakanian, Reza and Hülsmann, Stephan, “Impact of Global Change on World Heritage and on Environmental Resources: The Need for an Integrated Management Approach” in Climate Change as a Threat to Peace: Impacts on Cultural Heritage and Cultural Diversity, ed. von Schorlemer, Sabine and Maus, Sylvia ( Frankfurt am Main: Peter Lang GmbH – International Academic Publishers,2014), 101-117. Hülsmann, Stephan and Ardakanian, Reza ed. Special Session at the Symposium of European Freshwater Sciences (SEFS 8): Societal Concerns and Capacity Development 2013/07/01-05 Münster, Germany. Dresden, Germany: United Nations University Institute for Integrated Management of Material Fluxes and of Resources (UNU-FLORES), 2014. Hülsmann, Stephan and Ardakanian, Reza ed. Regional Workshop on Establishment of a Network for Partnership of UNU-FLORES Based in Maputo, Mozambique 2013/05/06-08 Maputo, Mozambique. Dresden, Germany: United Nations University Institute for Integrated Management of Material Fluxes and of Resources (UNU-FLORES), 2013. Ardakanian, Reza, Hülsmann, Stephan and Johmann, Jessica ed. 2nd International Scoping Workshop 2011/10/24-25 Maputo, Mozambique. Paffenholz, Germany: UNU-ViE, 2011. Ardakanian, Reza, Hülsmann, Stephan and Johmann, Jessica ed. 1st International Scoping Workshop 2010/11/11-12 Dresden, Germany. Bonn, Germany: UNU-ViE, 2010. Hülsmann, Stephan, Harby, Atle and Taylor, Richard (2015). The Need for Water as Energy Storage for Better Integration of Renewables. Policy Brief. United Nations University Institute for Integrated Management of Material Fluxes and of Resources (UNU-FLORES). Gan, Thian Yew, Hülsmann, Stephan and Ito, Mari (2012). Drought, Climate and Hydrological Conditions in Africa: An Assessment Based on the Application of Remotely Sensed Geospatial Data and Various Models. Working Paper. United Nations University Institute for Integrated Management of Material Fluxes and of Resources (UNU-FLORES).